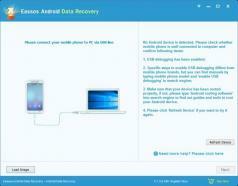 Eassos Android Data Recovery is a practical tool that enables you to recover lost data from Android smartphones, tables, and other devices. The program allows you to recover all kinds of data such as photos, documents, music, videos and so on, that have been accidentally deleted, formatted, rooted improperly, went through a buggy system update or any other kind of “disaster”. Eassos Android Data Recovery works with Android versions starting with 2.3 and up and supports most brands such as Samsung, LG, HTC, Sony, Motorola, and so on. The recovery process is extremely simple thanks to the friendly recovery wizard and you can save the scan progress to resume it later.